NAMM 2011 PRESS RELEASE: Mackie today announces an ultra-compact new addition to its bestselling Thump Series portable, powered loudspeakers - the Thump TH-12A. Delivering the perfect balance of power, portability and price, the new 400-watt, 2-way 12˝ Thump Series loudspeaker is perfect for any application that demands high-output and professional sound without breaking the budget. The new TH-12A is designed by the same award-winning team that created the industry-standard SRM Series powered loudspeakers, delivering proven Mackie build-quality and sonic performance. The TH-12A's efficient Class-D Fast Recovery amplification provides 400 watts of total system power, tuned to perfectly match the custom-designed 12˝ high-precision woofer and 1˝ compression driver. An integrated 3-band EQ on the back panel allows the user to dial in the TH-12A's tone, perfect for simple room correction or tonal adjust per application (vocal only, low-volume, etc.). Featuring Mackie Active electronics, the precision crossover and transducer time-alignment optimize the system while protective circuitry protects against overload and thermal shutdown. 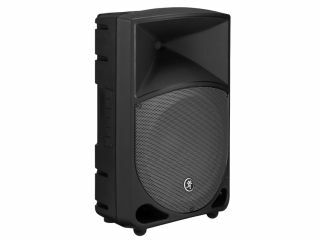 Pole-mountable and ideal for use as a stage monitor, the TH-12A's lightweight design offers undeniable portability. "Now there's a great, ultra-compact Thump loudspeaker," remarked Young. "…perfect for vocal applications, solo performances or for use as a DJ monitor, too." The TH-12A will be available worldwide in Q1, 2011. The TH-12A will have a U.S. MSRP of $389.99. Visit Mackie during NAMM in the massive new showroom upstairs in Demo Room 209A/B from January 13-16, 2011 in Anaheim, CA.